When I met Sean I told him that I wasn’t looking to make friends, he told me he wasn’t asking me to marry him. It wasn’t the last time that I would be faced with something that I hadn’t quite thought all the way through. Eventually he did ask me to marry him and I said yes without hesitation. We talked about having kids and celebrated in disbelief when we saw the first pink line. We had no idea how much life would change or how much we would change. I still have a chip on my shoulder, but it doesn’t prevent me from loving the way that it did the summer we met. He is still a romantic, but the years have hardened some of his edges. Having a family and starting a business has forever changed us. We are, evermore, parents. Parents to our children and to our work, the former being the reason we pressed on for the latter. I was pregnant with Briar when we started Trampoline, a Minority and Women-Owned Business Enterprise in New York State. I have contributed to the company every step of the way and have been grateful for the flexibility it has given me over the years. Oh, the brochures that have been written with one hand, as I have held a nursing baby in one arm and run the fingers of my other hand over the keys—sometimes in my office with the door closed, other times at home. Talk about needing to lean in. Here’s the thing, I had no idea that when I became a mom I would want to stay home, nor did I have any premonition that years later I would ache to work more. People didn’t say that I would be judged for wanting to work, that somehow I am less loving as a mom for wanting to pursue a career. No one shared or admitted that how I viewed my place would shift so dramatically. This fall Finley will head to kindergarten, which will mark the first time in nine years that from the hours of 8-4 my children will, for all intents and purposes, be otherwise occupied. My ability over these years to readjust as my emotions and their hopes demanded more or less of me has been a blessing. This does not mean it has been easy. Owning a business and taking a day off does not mean that you don’t have to make that time up, nor does staying home and focusing on art projects not create challenges financially. I suppose this is where some of the frustration with the Sheryl Sandberg book comes in—she had help, she had a spouse, and one who made a decent wage. I have heard the argument that if I couldn’t afford to stay home I should not have had kids. People are entitled to their opinions, but as far as the Sheryl Sandberg book goes, or the edict from Yahoo that there would be an end to telecommuting, and as far as the mommy wars and every other media-fueled feud about how we parent and how we rise professionally, there is no one size fits all. There will never be a single voice that comes from a figure who mirrors our own image. We have to carve our own way and take the pearls that come from the different people and plans that we discover along our way. 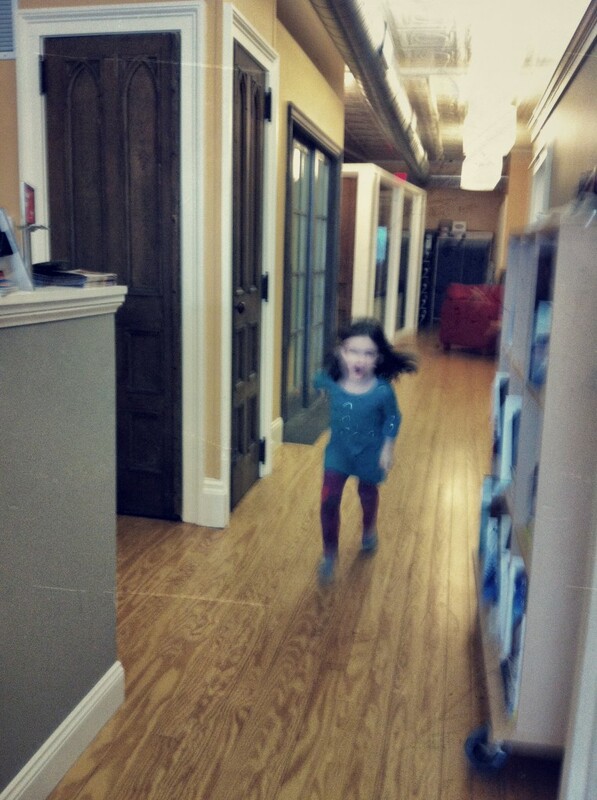 Yesterday I brought Finley to the office. Monday she had been too sick to go to school, and so we stayed home together. Tuesday she went with a dose of Pedia Care multi-symptom cold medicine in her belly. Yesterday? Yesterday we were running late. There was a one hour delay for the big girls, we had to stop at the pharmacy and I had a 9am meeting that had slipped my mind. Driving out of the pharmacy parking lot I said, “Fin, do you want to go to school or come to my meeting?” She picked my meeting. Is this something that I would do a year from now when she is in elementary school? Probably not. Right now though, I can choose this. 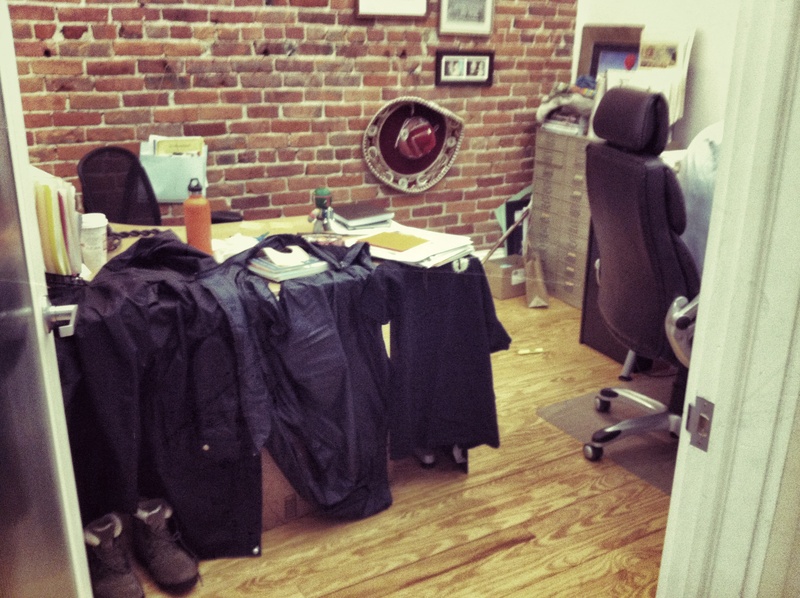 I love the way the girls occupy the space at the office, they greet anyone they meet with respect and genuine interest. They consider our downtown neighbors and our clients to be a part of their circle. They are respectful of our things, but they are also kids. Finley sits with Derek and recites There Was an Old Lady and every time Derek ends in tears of laughter and thanking her for the great break. She tears down the hallway between meetings with an infectious joy. 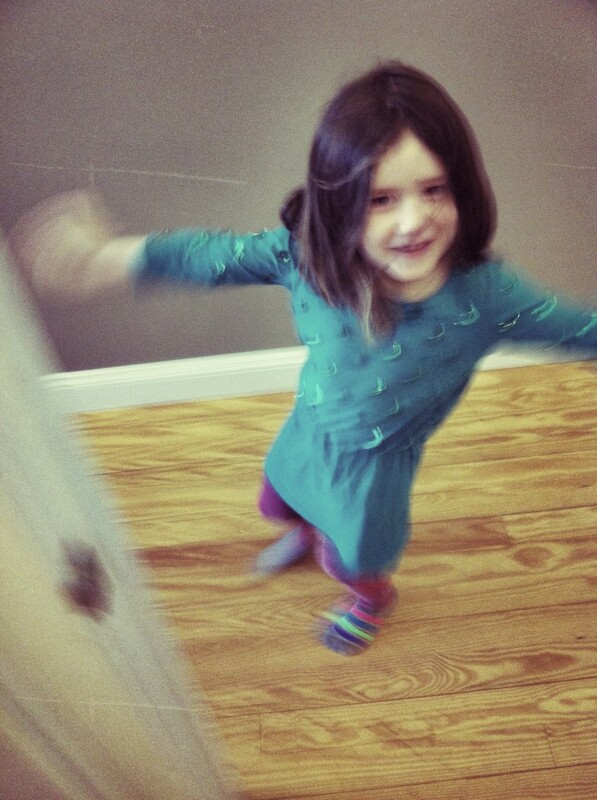 She stops at each door, arms thrown wide, socks intentionally mismatched and I can almost hear the shutter of a camera as I seal these moments in my bank of memories. They sit alongside my own memories of marveling at the art deco ladies room in the Hult Center and of sitting on parade floats for the United Way, when I was little and one of two daughters of a working mom. 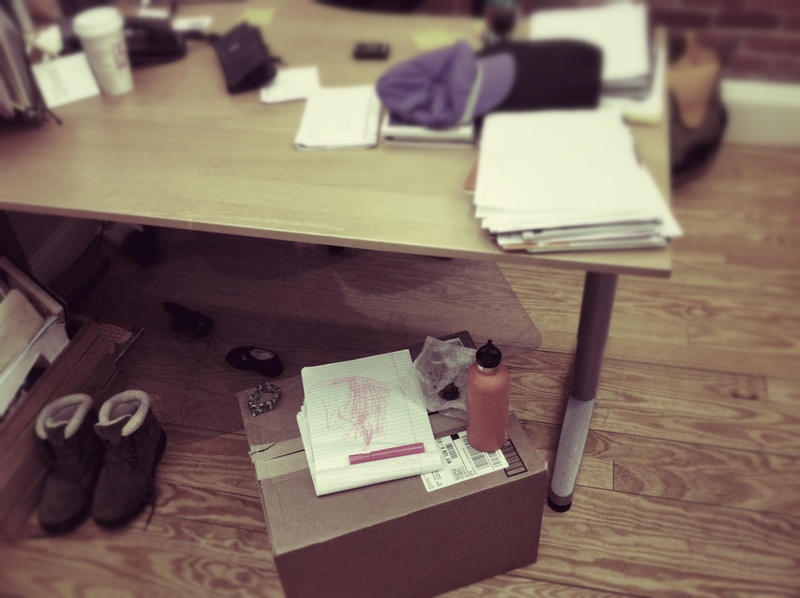 We build forts and construct a mix of productivity and levity. Some days these actions are steeped in a kind of guilt, is it guilt that I am not working? Guilt that I am? Or is the truth that I am not trying to have it all and that I am simply working on and with what I do have? When she’s not at the office, she is still here. They all are—there is artwork from Briar, a hat from Avery, lists from Finley. I ache with loving them and wanting to be the best that I can for them. My place is in the quest, this ongoing process of building a foundation that provides for our family, allows me to feel that I am contributing to our community in a meaningful way, and in the piecing together a childhood for our girls that has people who love them and experiences that offer perspectives that will serve them as adults. I am not perfect at this, but as I try to be deliberate about parenting three daughters, I don’t want them to think that perfect is attainable. Failure and disappointment are things that happen, just as love and bliss do. I believe that the greatest gift that I can give them is a template of striving to be a loving parent, a considerate partner, a responsible citizen, and a person open to hearing what other people have to say. I also want them to know that regardless of the opinion of others, if they listen to their hearts they’ll know where they belong and that I love them. When I was young, my parents both worked together at an appliance store in our small downtown. I have many memories there – selling lemonade during the town’s festival, walking down the street for a milkshake, even having my first kiss in the storeroom out back (shhhh, don’t tell my dad). Your stories remind me of this time in my life. It was a very happy and memorable time for me, as I am sure it is for your girls as well. I can feel you being torn in different directions by guilt, and I know that my mom was, too, so long ago. I am here to tell you: Do not fret. You are doing great. And your girls will grow up and not be able to imagine their childhoods without this part of you, of them. I speak from experience. Oh, Shannon, thank you. I do get tripped up in wanting them to have an idyllic childhood, but it’s easy to forget that how they measure is not by the same gauge I use. Thanks, Ang. You made my day. I tend to say, “If you can stare yourself down in the mirror in the morning and feel ok, then you are doing ok.” Although I read another post that talked about ditching guilt, I just can’t imagine that that is entirely possible. Thank you for this very supportive comment! Oh, this is so lovely, makes me ache inside. I am about 1/3 of the way into Lean In, and as with everything I’ve ever read (or written) about the parenting/work/life ball of wax, it touches some deep, expansive, and totally inchoate ocean of emotion inside of me. I just start crying. I’m not sure why. I am, like you, both extremely mindful of the role model I am for my children (both boy and girl) and sometimes overly-invested in the idea that their childhood needs to be idyllic. Mine wasn’t (my mother always worked, too, and I have such memories of being at her office) and I am fine! I can’t imagine a scenario in which I weren’t wondering if I was on the right track. I suppose to a certain extent, the way I consume things in the media has me feeling more judged than I might otherwise. Some of my favorite times as a kid were the times I spent kicking around din the backyard by myself or along the periphery of the work things that my parents did. I never tire of reading about how moms negotiate these questions and challenges. This was a great post, reminding me that work/home is never really balanced but each day we manage to entertain, love and care for our kids while still making an impact at work. I’m beyond lucky to work from home but I work late at night and frequently feel cut off from the world. On the other hand, I love waking up in the afternoon to the sounds of my kids coming home from middle and preschool and I’m rarely rushed to do anything outside the home. And I’m rambling…love your writing. I love your rambling. Thank you. When you hold a coin, you look at its front, it’s back, the smoothed outer edges and the patina of its years. You imagine the insides, its structure and its worth beyond its currency. When you, Amanda, live your life with such truth, love and insight, your daughters will benefit. They already have. Loved this piece. Just loved it. These questions are hard. I’ve chosen to stay home with our children and that choice has been right for us but, as you already know, that doesn’t mean that my decision was easy, or that my thoughts don’t go to the “what-ifs” of my defunct advertising career. I worry because my children don’t see their mother in a professional setting–I worry that they don’t know that many families and many women make many, varied decisions. And so, I talk to them about all of opportunities available. I hope this opens their eyes and hearts to the many paths their lives may travel. We all struggle this way. It’s important to chat with the women who are older and have made the decisions to either be at home or work. They will give you the insight you need. Not some book. I remember being in the elevator at my job. On my way to a Thanksgiving luncheon at my son’s school. I got caught up in a task. I was running late. I remembered the times my dad missed my recitals, games or events because of his “work”. I detested his work. It was that moment that I realized, there was never a choice of children or work. He did his best FOR ME. BECAUSE OF ME. It was ME that gave his life meaning. His work meaning. There was never a choice. I was always the one in his heart.. just like my son is my reason for being. Oh the years I spent feeling sorry for myself .. for nothing. The thanksgiving luncheon went great. My boy was happy to see me. There were children whose parents didn’t come and they were happy too. In the end… it the time you spend with them that needs to be quality. It’s that time that needs to matter. Everything else will fall into place..